Members of Cadot-Blessing Camp #126 from last year’s Memorial Day Ceremony. They will be honoring veterans again this year on Monday. GALLIPOLIS —Members of the local Cadot-Blessing Camp #126 SUVCW will conduct a Memorial Day Ceremony at the Pine Street Cemetery, 9 a.m. on Monday, May 28, 2018. The ceremony is held at the Pine Street location due to the large number of Civil War graves located there along with four Confederate soldiers, most of them dying in the local Camp Carrington Hospital which was located on the present grounds of the GDC. The Cadot-Blessing Camp #126 SUVCW is a local group which looks to preserve that history for the current and future generations. SUVCW is a volunteer, non-profit, charitable, fraternal, patriotic and educational organization similar to the Grand Army of the Republic (GAR), which was the largest Union Civil War veterans’ organization. The SUVCW is officially recognized as the GAR’s legal successor, receiving its Congressional Charter in 1954. The Cadot-Blessing Camp #126 is Gallia County’s own extension of the SUVCW with around 20 members. 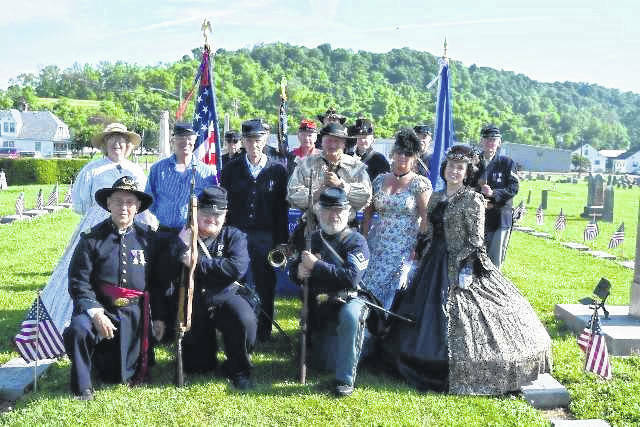 The group, which was founded in 2003, has done its best to preserve the county’s Civil War past and honor Gallia County’s Civil War veterans and their place during that specific time in history. Commander James Oiler said though Gallia County had no claim to any major battle, City Park in Gallipolis was an important “depot” during the Civil War and acted as a staging point for supplies and troops. Oiler said the main reason the group exists is to “honor them” (soldiers and ancestors from Gallia County and beyond who served during the Civil War). The group has even helped replace the headstones of those veterans which have become illegible. It has honored local Civil War veterans such as the late James Madison Gatewood. Gatewood was the last Gallia County Civil War veteran. He served in the 195th Ohio Volunteer Infantry Company G and enlisted on February 25, 1865 and served until mustered out with the Company on Dec. 18, 1865 at Alexandria, Va. He is buried at Mound Hill Cemetery. One of the misconceptions of the group is that they are “re-enactors,” and that is not the case. Oiler explained camp membership and re-enacting are two different activities. He said the group focuses on educating the public about the Civil War history of the area, hence projects like honoring Gatewood. “We do this to honor our ancestors, we do it for them, it’s not for us,” Oiler said. Like any organization, it gets tougher to get volunteers to join. Oiler hopes to get new members to carry on the tradition of remembering the soldiers and the area’s Civil War past. In order to join, members must have had a relative who served during the Civil War. The chapter has a permanent home at the event barn on Bob Evan’s Farm in Rio Grande where its held its installation of officers. The officers were installed for the 2018 year by Kerry Langdon, Sr. Vice Commander of the Ohio Department of SUVCW. Those officers are James Oiler, commander; David North, historian; Kerry Langdon Ohio Department SVC; David Carter, JVC; Bill McCreedy, patriotic instructor; Dean Brownell, secretary; Sam Wilson, treasurer; Henry Myers, chaplain: Ron McClintock, memorials officer; John Holcomb and Dale Lamphier, council members. The group regularly participates in the memorial ceremony marking the Battle of Buffington Island in nearby Meigs County. Members also support local events honoring veterans in Gallia County and attend schools to teach students about the Civil War era, among other activities. The group honors all who have patriotically served the country in any way. The SUVCW is an organization also known for promoting an understanding of history, promoting patriotism and the duties of citizenship. Some might ask why something that happened over 150 years ago matters now? Perhaps there is still value is remembering and noting, despite the division, the Union adjusted and survived anyway.